The El Guapo burrito at El Pelón Taqueria in Boston. This is review No. 12 of 16 in the first round of our competition. Each review will compare four burritos, with my favorite advancing to Round 2. This week, I make a final sweep through the Northeast region of the Burrito Bracket — starting in Buffalo, New York, and ending in Boston — and turn up some surprisingly delicious burritos in unexpected and out of the way locations. Although it was parked in a construction-filled plaza, the Lloyd taco truck had an incredibly long line the day I visited. Nearly 30 minutes passed between the time I got in line and received my food; a long queue of office workers had waited patiently in front of me. 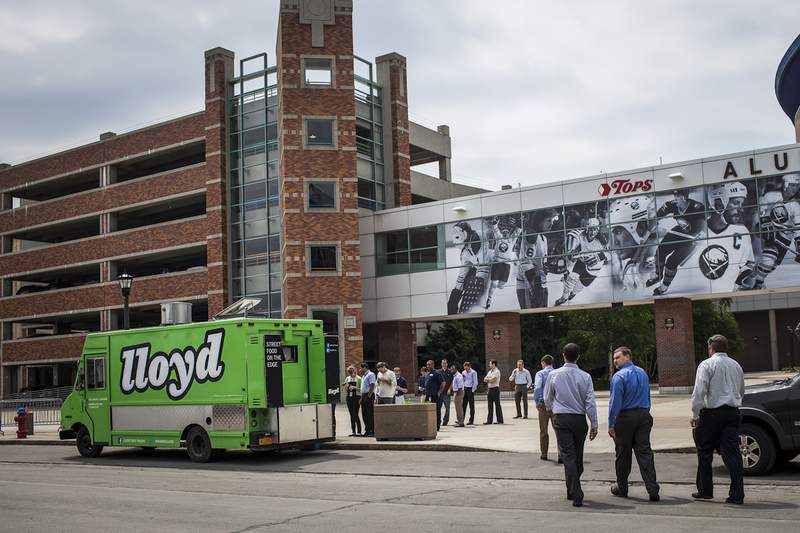 Since it opened in 2010, Lloyd has grown to a three-truck (OG Lloyd, Lloyd Dos and Lloyd III) operation. I opted to eat at the OG truck because 1) it’s the original and 2) it was near downtown Buffalo that day, between the Sabres’ arena and an enormous office building. I wanted to see what all the online fuss from workers was about. I ordered slow-roasted pork, which was surprisingly rich and tender, even if it didn’t have the broad flavor or historic quality of many of the Southern burrito-selling establishments. Lloyd’s crowning achievement is the use of thinly sliced, crunchy cabbage in lieu of lettuce. What makes this switcharoo so powerful is that, though the cabbage is a key feature, it is still treated as a supplemental ingredient, meaning it isn’t piled on so high it diminishes other flavors or dries out the burrito. From there, straightforward white rice and black beans combined with thin and subtle sour cream and orange shredded cheddar. The tortilla was served just as it had been purchased that morning from Father Sam’s bakery in Buffalo: fresh, with no steaming or griddling. I stripped away folds of tortilla on one side of the burrito to balance out the ingredient/wheat flour ratio. Lloyd’s handmade Rocket Sauce, available for purchase in bulk, has a hint of heat and is superior to most store-bought brands. 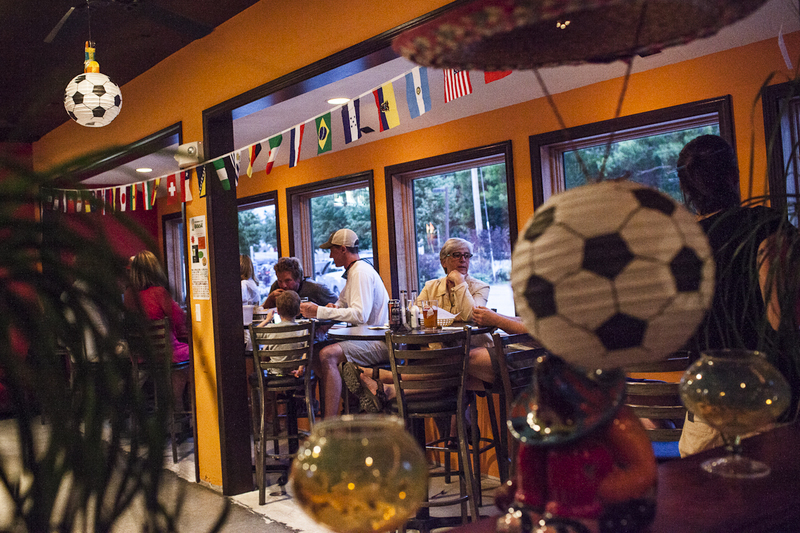 Kittery, Maine, seemed a strange place to find California-style Mexican food. During the Burrito Selection Committee meeting, I pushed for its inclusion because so many online reviews expressed what seemed to be genuine glee and surprise at the quality of Loco Coco’s Tacos’ food. A healthy amount of skepticism accompanied my hopefulness when I visited. I was expecting a small shack, but Loco Coco’s is a veritable structure: You enter a large room with seating and a takeout counter. The next room holds an oversized bar, which opens to an informal dining room, which has doors to an outdoor patio. Each room has brightly colored walls, miscellaneous dancing skeletons and Mexican crafts. Speakers play the familiar timbre of mariachi trumpets. 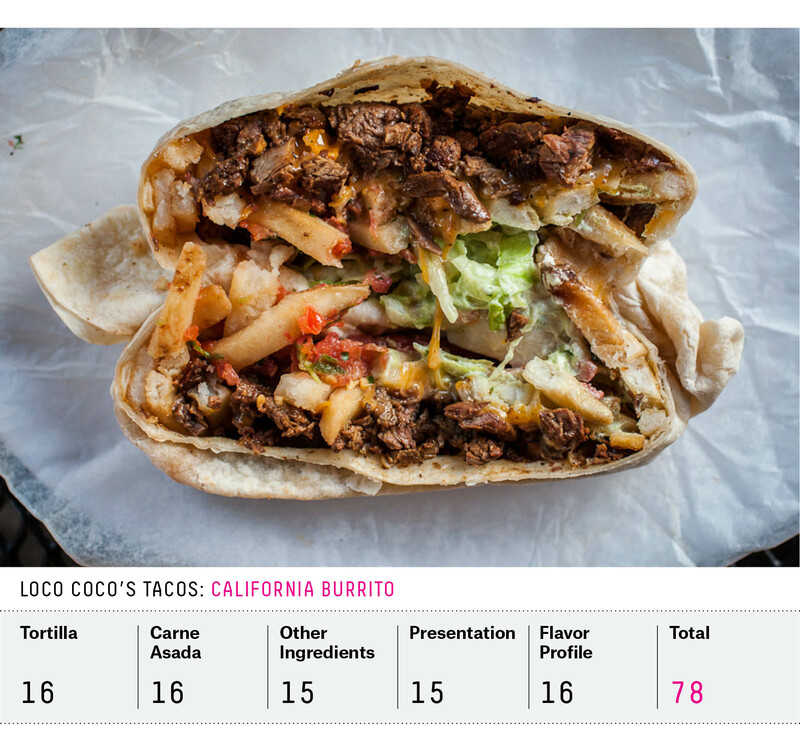 The sum of the parts is far superior to the tasty individual ingredients in Loco Coco’s California burrito. The carne asada was the color of molasses, the French fries cut thick and fried until crisp and golden. Of the array of sauces on order, the cream of avocado and green chile fuego (I can confirm the accuracy of the name) spoke most to me. The tortilla was surprisingly thin and delicious, with a pliability and variation in color that would suggest it was handmade. Add lettuce and cheese to the aforementioned, and you have a luscious burrito, juicy yet crunchy, simple yet bountiful in flavor. As an aside, it was at Loco Coco’s that I realized I am essentially a burrito assassin. Everywhere I go, I buy an extra burrito, slice it open and take its picture. Although I try to take most of the dissected burritos home for breakfast, I am often forced to leave behind a perfectly harmless burrito, severed in two, the mark of some sort of deranged burrito serial killer. I can only imagine what the wait staff thinks. 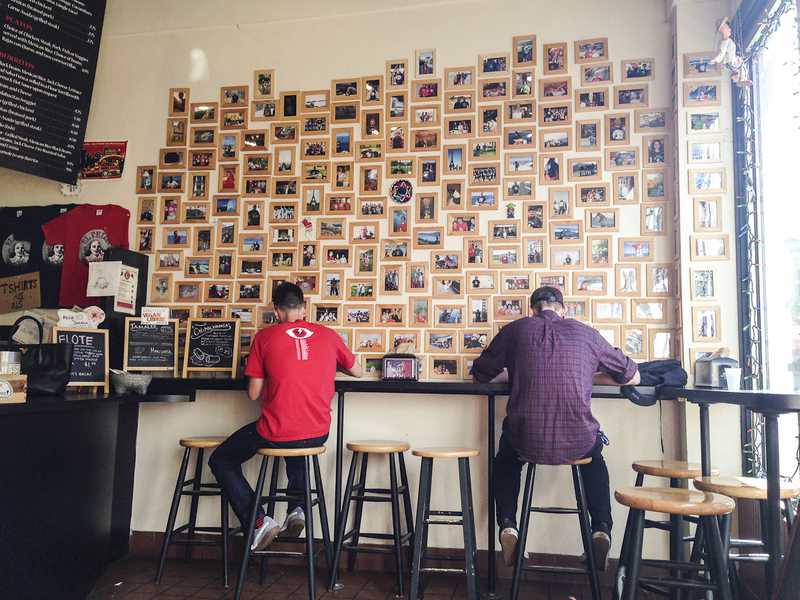 Before heading to Boston, I checked in with friends who live or have lived in the Bean. Everyone knew of Anna’s Taqueria, had a soft spot for it, and agreed that it was of the utmost importance that I go to the right Anna’s. Unfortunately, they all had a different idea of which location that was. And so I ended up in Brookline, at the most popular of the locations, according to Yelp. Anna’s is on a busy corner, in a fairly nondescript pair of rooms with pale yellow walls. One room houses the assembly line, the other seating for orders to stay. A lone cactus in the corner breathes life into the space. On the assembly line, you start by choosing between a regular-size burrito (with a 10-inch tortilla) and super (12 inches). What’s impressive is that the size doesn’t dictate the number or quality of ingredients. I chose the smaller tortilla and found that it contained the full flavor profile. 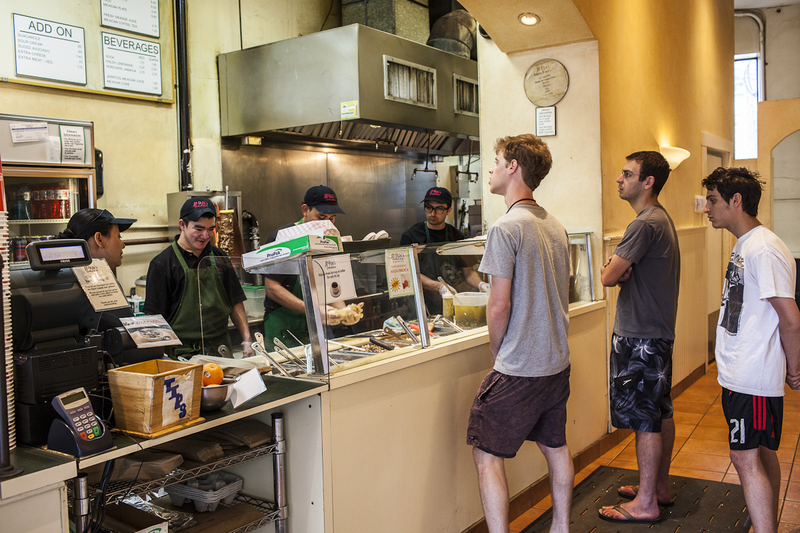 Once you’ve ordered, a worker places cheese on a tortilla and the tortilla on a griddle. I ordered my petite bundle with chicken, black beans, lettuce, tomato, sour cream and guacamole. I was informed that “el pico no pica,” meaning the pico de gallo wasn’t spicy, so I added hot sauce (available by request for no charge). The tortilla was piled high, folded in half, tucked in on either end, and then cinched and rolled until the ingredients were packed tight with no breathing room. It was a masterful rolling technique. A reader sent me a note just days after I visited Anna’s to let me know that, because I prefer a griddled tortilla, I might want to try the quesadilla at Anna’s, which is rolled and prepared just like the burritos, only it’s griddled. Had I known! 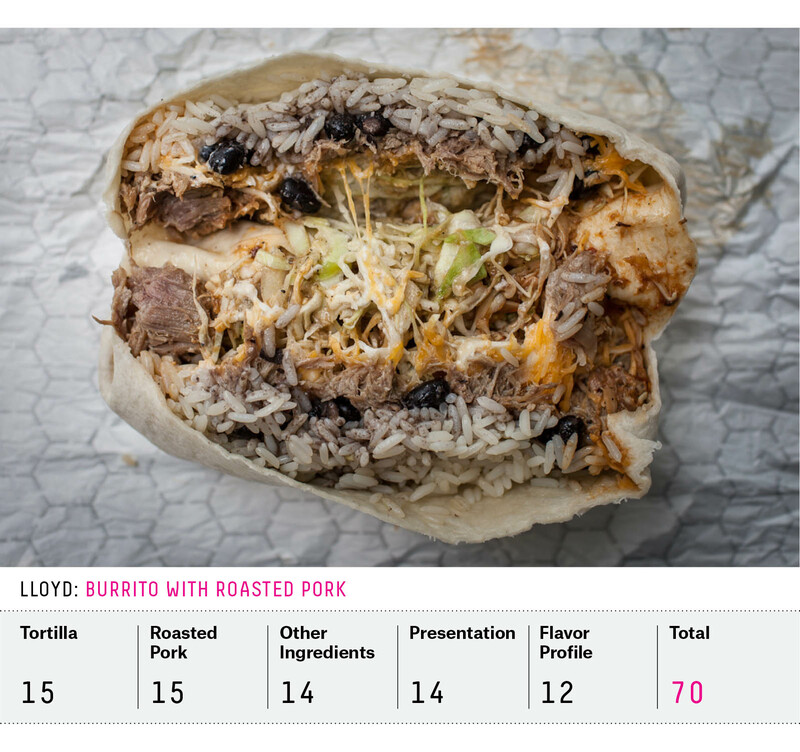 The burrito doesn’t have many defining characteristics, but in a city such as Boston, that might be what makes it work. 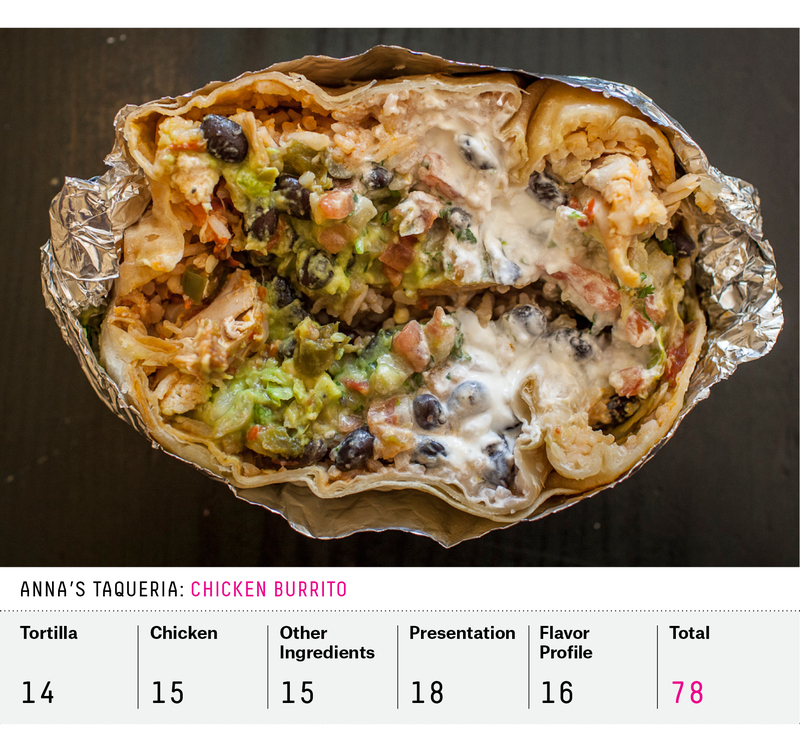 See, Anna’s makes a perfect starter burrito suited to all palates — fun for the whole family, even if a little devoid of personality. I will be back for the burritos and the quesadilla. El Pelón (which means “the Baldy”) is a couple of blocks from Fenway Park. I’d never been to that part of Boston and expected a looming structure with a moat of shops selling sports paraphernalia and hot dogs, like near Yankee Stadium. But the area around Fenway is actually a gentrifying urban center, with mixed-use buildings, a school and an older housing project in the blocks between the Taqueria and the baseball field. I arrived at El Pelón with some expectation, because the Burrito Selection Committee had seeded it No. 2 in the region. I ordered the El Guapo (“the Handsome Man”) with guacamole. Inside, Mexican rice, black beans, jack cheese, fire-roasted salsa, crema, lettuce and steak were packed tightly, bound by a standard tortilla. Buried like hidden treasure were the crispy, sweet plantains. The steak was tough, but every bite featured a variation of the ingredients that made me keep going back for more. I had no choice but to eat the whole thing. My only real concerns with El Pelón are that it uses romaine lettuce and that my burrito was made exclusively using the ribs — filling it with large, excessively crunchy bits that distracted from the other flavors. Another tough call: A California burrito so far from home, and yet so full of love for its origin; a simple burrito rolled to perfection; burrito salvation in a town so desperate that people will spend 30 minutes of their lunch hour waiting in line. 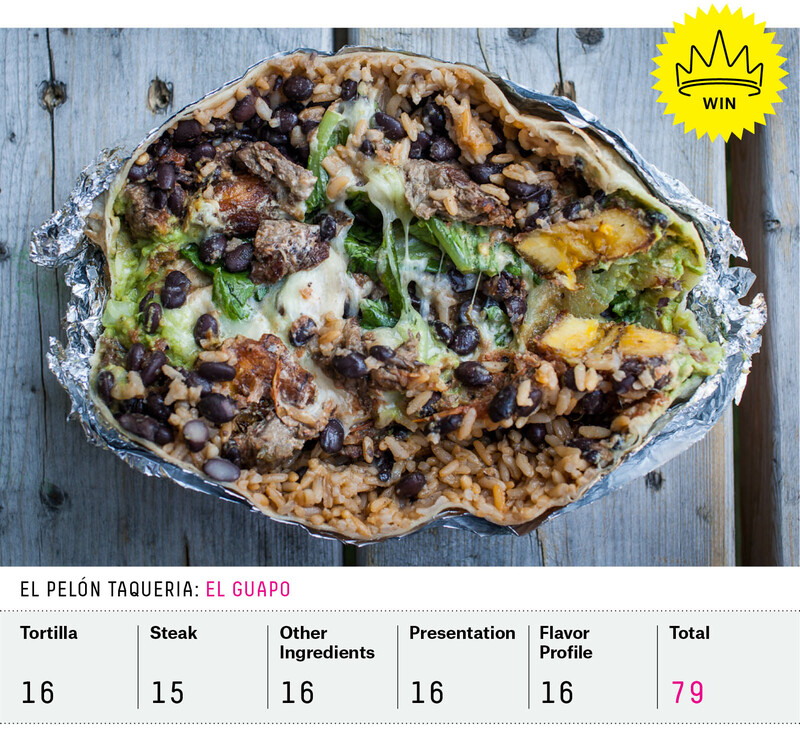 But in the end, the golden plantains and all-around solid ingredients in El Pelón Taqueria’s El Guapo won by a single point.